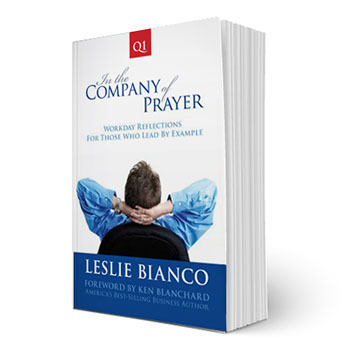 Our mission is simple: to provide a quick, daily prayer specifically to businessmen and women, who, like us, find prayer to be an inspirational tool in the management of our professional lives. We do this through our Morning Briefing email prayer service. 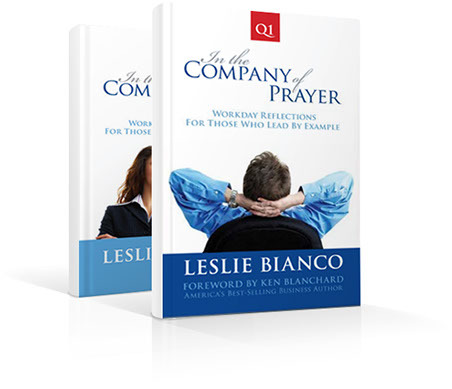 An interview of Executive Editor Leslie Bianco in EntreWorshippers: Conversations with Artists, Entrepreneurs, Business Leaders, Change Agents, and Risk Takers who Work by Faith and Impact Culture. We're building a community: The Morning Briefing email prayer service was test marketed with a group of individuals who described their personal faith tradition as Catholic, Baptist, Jewish, Lutheran, Presbyterian, Episcopal, Christian, Evangelical Christian, Mormon, Science of the Mind, Protestant and None. The pilot was slightly skewed toward Catholics, however, the community is ever-changing as new subscribers, representing a wide range of faith histories, are constantly being added. 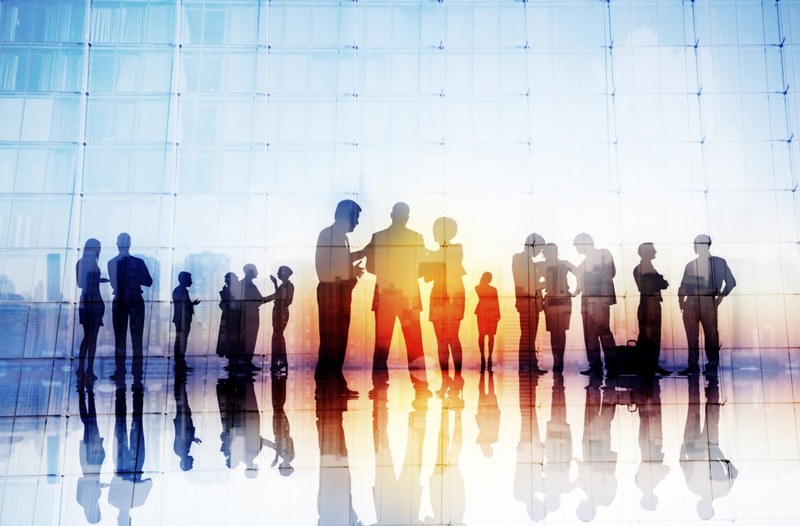 Our current members span fields of expertise from technology to entertainment, academia, real estate, law, banking, professional services, apparel, sales and marketing. We began in Southern California, and in no time moved throughout the U.S. Within the first days of our campaign, we found our service reaching inboxes in Brazil, Australia, Canada, Hong Kong and Europe. Help us spread the word by forwarding any of the Morning Briefings you receive to others you feel would be interested. We incur the usual business expenses: Additionally, there is an old adage that anything paid for is valued more than that which we receive for free. Thus, we have added a voluntary subscription fee link which is for your complete security and convenience. Subscription fees help pay the usual business expenses incurred in management and delivery of our "Morning Briefing" emails each workday. We suggest an annual fee ranging from $12 (that's only $1 a month) to preferably, $50 per year (less than $1 a week). Q. I received a Welcome email and then a couple of Morning Briefings, but then they stopped. What happened? A. Your Spam-blocking software is probably blocking your Morning Briefings. Please make sure that info@companyofprayer.com is added to your safe senders' list in your Spam blocking software and that you have added us to your address book as well. Q. What is the easiest way to contact a real person at In the Company of Prayer? A. Reply to any Morning Briefing. That address is info@CompanyofPrayer.com. Q. I forward the Morning Briefing emails to a list of buddies and colleagues every day. Is that allowed? A. Sure it's allowed, even encouraged. At some point, however, you may want to encourage your friends to subscribe themselves to take the burden off you. Q. What's the best way to change my email address? A. The easiest way will be to unsubscribe and then re-subscribe with your new email address. This also goes for if you have a profile with us. There is a link to unsubscribe at the bottom. You can re-subscribe with a new email address, but all your favorites will be saved. Q. Where do you get your material? A. Divine inspiration, of course, as well as research and, best of all, subscriber recommendation. We love it when our community gives a little feedback, the heads-up and even analysis of our service. Simply reply to any Morning Briefing email or contact us directly at info@companyofprayer.com. Q. I feel a little guilty about not paying for this service. Is there some way I can contribute? A. There is a link to our site at the bottom of each Morning Briefing for easy access to the voluntary subscription features, or you can visit our Help Us page directly. Contributions we receive through voluntary fees are used for the usual business expenses we incur. Payments can be made monthly or annually and can be recurring in nature. You can also make a one-time donation. We also gladly accept checks. Please make payable to In the Company of Prayer and send to: P.O. Box 218 • San Clemente, CA 92674, USA. Q. I just figured out that there are many useful links in your emails, such as to Sacred Space, to listen to a clip from a song quoted or to buy one of the books referenced. Do I need to be at my computer for these features, or can I use my PDA? A. Whether you are using a computer or any web-enabled mobile device, you can click through to Sacred Space, the voluntary subscription fee page, the Company Store, the website of someone featured, Instant Prayer, our Prayer Resources or access the Home Page, by pressing, in most cases, the title, or using the click here buttons indicated. 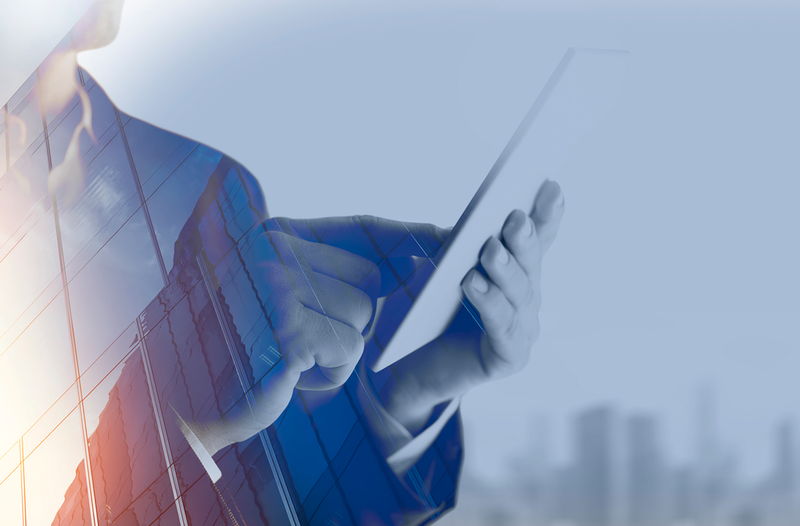 Web-enabled mobile devices include "smart phones" and PDAs. Q. What are favorites and how does this work? A. Each morning briefing on our website now has a "heart" button that you can select and it will add this briefing to your favorites list. You can create a profile to access all of your favorites. You can also create a profile by using single sign-on with Facebook and Google. Thank you for the daily gift of In the Company of Prayer. It is a blessing to open everyday amongst all the emails awaiting reply and find a prayer, thought, scripture reflection or meditation to take along the journey of the day. Prayers for you as you change your latitude - have you ever considered walking the Camino de Santiago? It's an awesome pilgrimage... as should be the upcoming World Youth Day gathering in Krakow. Please include the health and well-being in mind, body and spirit for all of the pilgrims involved. I am happy to give you my favorites. Two I have printed on the wall - one from 5/19/09 and one from 11/16/09. There was one from about 2 years ago about passion and doing what you love, I have it somewhere but it was my favorite and applied to me and how I started my business. Please know that you are my first click of every weekday - my first prayer and inspiration. There are others that do follow but you are first. Your inspirations are most important to my day and I am always surprised at how many apply. Please continue what you do! Thank you. My favorite was last week, I think. The one about how fast children grow up. Thanks for your ministry, since I haven't been able to pray in a manner that I'm used to I really love my morning briefing! Hello There, I really would like to thank you and your wonderful team for helping a lot of people remember and stay connected to God in the hard times that a lot of us are facing these days. I have copied some of my recent favorite prayers, although there several that I have found very helpful. Thanks again. I have come to depend upon the prayers and wisdom so graciously shared every morning by "In the Company of Prayer" in order to begin my day in a serving state of mind. With that said; the impact of a late arriving message or no message at all is profound and makes me feel as though I am going to battle without my armor! Thank you for asking and may God Bless your life and this project. Super excited for you and what God is doing. May God bless all that you do in this transition. Thank you so much for Company of Prayer. I read it each day and have done so for years. You are a blessing to me! I can't remember the best ones, although I have a couple taped to my computer to remind me of what I need to do in life. The one is "We all need backbone as we take on a new year; may we be fortified through prayer." And the other one may be a little older.....That my faith guides me today and every day I pray. The reason I saved this one was because of the quote from Jeff Benedict "I think what is important is to have people run things who are principled, who have a set of ethics and who are anchored to those beliefs and ethics. It doesn't matter if you are Jewish or Catholic or Mormon; what matters is that you take those values and you actually apply them. You bring those values to work." The last one taped on my computer is "For the ultimate standard in integrity, let us pray." with the additional comment quote from Mike Paul to the effect that ethical behavior defines who you really are. Thanks again for nurturing me in my work life. This is the only place I receive this kind of help. I have been enjoying your prayers for a long time now and, as the Christmas and holiday seasons approach, I think this is an appropriate time to thank your prayer group for the morning prayers. Each day when I access my computer I read the prayers, aloud, before continuing on to open and reply to other emails. The prayers, shrouded in spiritual meanings, also have relevance to our daily lives. I observed that the prayers are also interpreted in ways to give that sought-after relevance in our daily lives. This is interesting and nicely done, so I think I will continue with the companyofprayer. I became acquainted with you and your ministry during one of the more challenging times in my life, and I want to say thank you, for the reminder to always pray for someone else. This brought about much joy in praying for others in the midst of the challenges in my life. I was able to focus on others, then the obstacles in my life became more bearable. God has always been here for me, he will never leave me or forsake me, lo he will be with me all the way to my end! It feels great to know that you will be doing something you are passionate about.. God has brought me a very long way and I will continue to trust and obey his call on and over my life! Thank you for your always encouragement! I pray the absolute best for you! I have been a subscriber up until today, and now I'm a "paid" subscriber, to your morning inspirational emails. There are a lot of emails that get sent, including regular types of "words of wisdom" similar to yours, that I just never feel motivated to read or even open sometimes. However, I ALWAYS enjoy "In the company of prayer", and look forward to opening it. In the midst of reading 50 or 60 emails everyday, and sorting the junk from the real emails, it's always a breath of fresh air to pause and open your email. So…I finally put my money where my mouth was in the case of your ministry today, and offered a contribution. This is not like me, because I also like receiving things for free! Thanks for your ministry…keep it up! I just love this site and thank you for how it more often than not touches me in the deepest areas of my heart. I find it hard sometimes to have a lot of time to pray and you focus me for the day as God blesses me with the insights contained here. May all of you be blessed as God has blessed me through In the Company of Prayer. You cannot imagine how comforting I find these readings to start my day. Thank you for these beautiful passages. 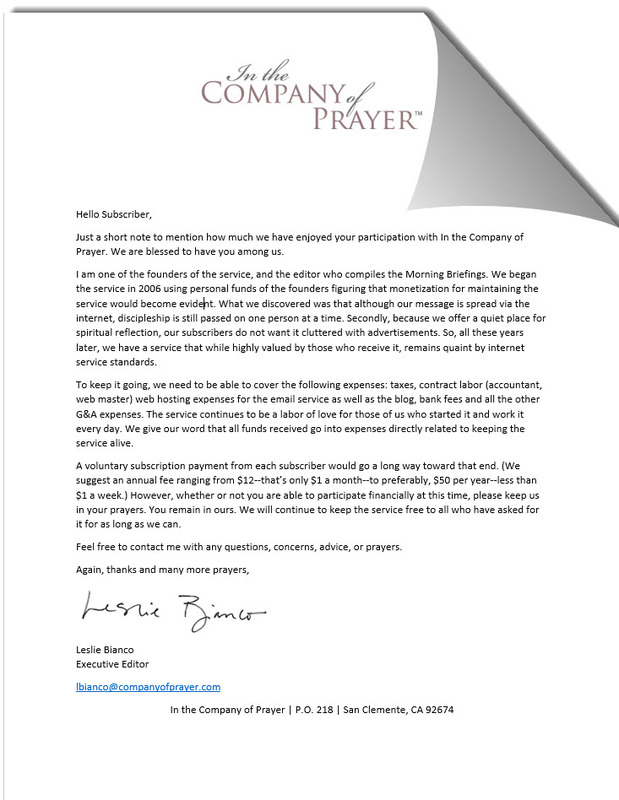 I really appreciate the Company of Prayer movement and feel we should all do our part to support those who want to bring faith into the workplace. I really like the 20 seconds it takes me to read your messages, and the links to good books on your site. Also, your first email of the year was my all-time favorite Jeremiah quote, so I have a good feeling about receiving the briefings. Abundant blessings to you! Contact us by responding to any of the emails you receive, or at info@CompanyOfPrayer.com. Another way to introduce others to the service is by using the "Click Here to Share Morning Briefings with Others" link on any Morning Briefing email. There are only four questions asked in our registration process (email address, country, title, and faith tradition). A fifth (zip code) is optional. Please add our email address, info@CompanyOfPrayer.com to your address book and safe senders list in your spam blocker to avoid having the messages flagged. The Paschal Triduum, often called the Easter Triduum or simply the Triduum, begins during Holy Week, and consists of Holy Thursday, Good Friday, Holy Saturday, and Easter Sunday. This includes the Great Easter Vigil, the high point of the Triduum. If you cannot be grateful for what you have received, then be thankful for what you have been spared. Please make all of your Amazon purchases, including books quoted, here. The small commission received helps to keep our service going and requires nothing additional from you as far as your Amazon purchase. "... our relationship to God must be found everywhere, at work just as at home, in our companies just as in our churches, and most of all in our hearts." "Fantastic book, especially if you are busy." Encompassing 26 weeks of insight and inspiration from business leaders and serious thinkers, all at a discounted price - only $17.90. Plus, save on shipping. Both books ship for the price of one. 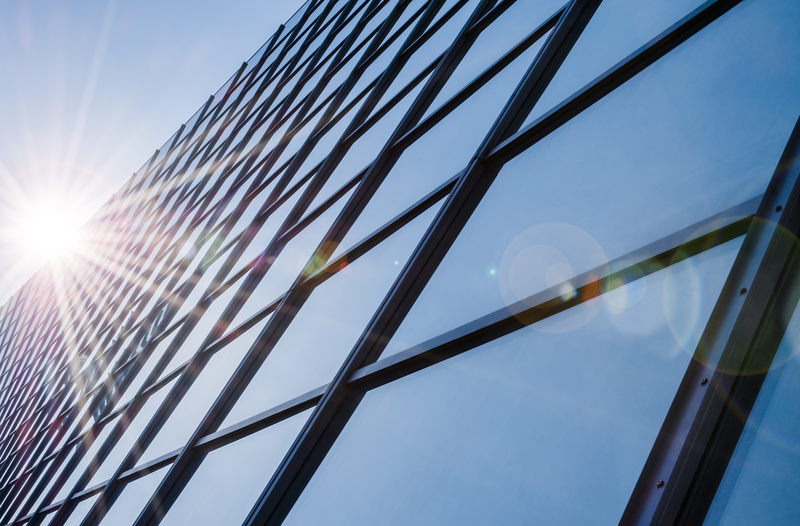 For Deeper Reflection: The email prayers are to serve as a reminder that we are spiritual people -- even in the office -- all of which encourages business ethics. Some of our members have expressed a need for deeper reflection. We are open to discovering other such strictly prayer websites from our subscribers. Pray As You Go: Produced by Jesuit Media Initiatives in the UK, you can download a daily prayer for your audio device. This service is useful for the business traveler. ACEGE: To receive Morning Briefings in Portuguese! EntreWorship: Guide for entrepreneurs, business leaders, disruptors, change agents, and counter-cultural catalysts exploring their calling and vocation at the intersection of work, faith, and culture. Help us spread the word by forwarding any of the Morning Briefings you receive to others you feel would be interested; Like our Facebook page, share/follow along on social media including our Instagram and Twitter. We incur the usual business expenses: Additionally, there is an old adage that anything paid for is valued more that which we receive for free. Thus we have added a voluntary subscription fee link for your complete security and convenience. Would you like to make a one time payment, or a recurring payment (ie: monthly/yearly)? Please enter the amount you would like to pay. You will enter your payment details through the PayPal website on the next page. Please select the interval between your payments, and the amount you would like to contribute per payment. You will enter your payment details through the PayPal website on the next page. The link you have followed is expired or has already been used. You may request a new password via the Forgot Password link on the Login page. Your password has been reset successfully. Please check your email for your new password. You may change your password later from your Profile. Please check your email. We have sent you a confirmation link which you must click to finalize your password reset. In the Company of Prayer respects the privacy of its members and is the sole owner of information collected on this site. We will not sell, share, or rent this information to others. We will never share, sell, or rent your personal information with third parties for their promotional use. We take every precaution to protect the confidentiality and security of your personal information by using industry-recognized security safeguards such as firewalls, coupled with carefully developed security procedures to protect your information from loss, misuse or unauthorized alteration. Loving and Gracious God, you are indeed the giver of all good gifts and we come together this day to seek your wisdom, guidance, courage and strength. Be with us in our deliberations and help us to be wise in the decisions we make for the good of all those who have placed their trust and confidence in our leadership. 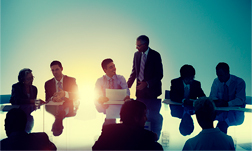 Give us insight to lead with integrity that our decisions may reflect what is right and good. Keep us from shortsightedness and pettiness. Help us to make decisions that strive to be for the good of all and guard us from blind self interest. Finally, dear Lord, grant us the humility to always seek your will in all that we do and say. All Glory be to you, loving God, now and forever. Amen. Almighty and gracious God. We your children gather here to share, for the good of this organization, and the common good, the gifts and graces you have given us. As we plan the work of this organization, help us be mindful of your charge to us to be wise stewards of this world and its resources. We are responsible not just for money or success, but for the well being of all whom we employ, and all who use our products. Guide us so we think wisely, plan carefully, and act diligently for the life of our organization. Lead us always to make choices based on your teachings; let us remember that you wish us to practice justice and walk humbly with you. With your guidance we will Lord, work to serve you as we serve each other through the various agencies of this business. We acknowledge that all we have is a gift from your almighty hand. Direct us to make only those decisions and plans that honor the law you have given us, serve those people we represent, and establish an organization that has a moral and social conscience. Start a "time of prayer" in silence. The time of silence should allow people to open their hearts to God and to feel what it is that they need or are thankful for (or both) that day and for any other needs that may be directly associated with the upcoming meeting. The silence should be about one minute in length. Allow another minute for people to express "briefly" prayers of petition or thanksgiving e.g. "Lord, please bless my daughter and son in law expecting their first baby." The conclusion of this time can be closed simply with words similar to the following: "Lord, we pray that you hear these and all the prayers of our hearts this day and all the prayers of all people who call on your love, aid and mercy." 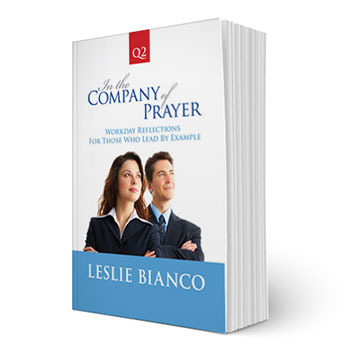 From "Timeless Prayers for Busy People,"
Presidents, Managing Partners and their spouses.